The THETA Z1 is using Android 7.1.2, which is almost the same as the V, which is currently using Android 7.1.1. The development process is the same. A few changes are needed to compensate for the differences in LEDs, OLED display, and special API features of the Z1. 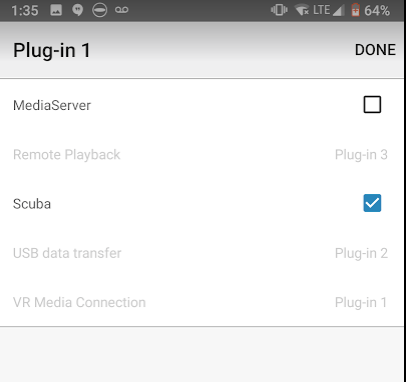 I decided to test the Z1 the SCUBA Plug-in I developed for the THETA V. I already had it loaded in Android Studio. The plug-in worked when I pressed play, but the Wi-Fi LED indicator that I used on the THETA V didn’t display the plug-in settings. This created a problem of not being able to identify the current color temperature setting. In my plug-in for the THETA V, I’m using the Wi-Fi LED color to indicate the setting. The obvious solution is to use the display panel on the Z1 to show color temperature adjustments. The RICOH documentation on the plug-in shows the use of broadcast intent to control the OLED display of the Z1. For my test, I didn’t modify the SCUBA plug-in for the Z1 as the Z1 does not have an underwater case for it yet. The SCUBA plug-ininstalled into the Z1 with no problem. As it’s not in the store yet, I used adb to install the plug-in. I set the default plug-in can with the mobile app. It will then appear on the camera display. You can also use the desktop app with a USB-C cable to set the boot plug-in. As I have a cheap Wi-Fi dongle that only supports 2.4GHz, I used the mobile app to change the Wi-Fi frequency of the Z1 to 2.4GHz. All the OSC APIs work great both from Wi-Fi and from inside the plug-in. Both Vysor and adb work the same as with the THETA V.
As there’s only one LED, most of the feedback will need to come from the OLED display. The Z1 also has an additional function button that can be accessed with keycode 119. Although the majority of the plug-in should work on both the V and Z1 without modification, some change will be needed to support the buttons and display on both models.